To participate in the Palmetto Kingfish Tour, an unlimited amount of boat-teams must pay the required minimum Level 1 entry fee of $500 by June 1st. There will be two optional, powered-up entry levels limited to 100 boats per level. The powered-up Level 2 fee is $1,500 and Level 3 fee is $3,000. Entry to Level 1 for all boats will open on April 1st and close on Saturday, June 1, 2019. However, teams within the Level 1 boat field may add the powered-up optional Levels 2/3 to their team-entry from June 1st until June 27th, by 8PM at the shared Palmetto Kingfish Tour Kickoff and The Lowcountry Open Captain’s Party. 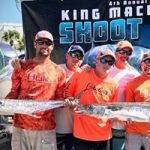 All boat teams participating in the Palmetto Kingfish Tour will compete for Level 1 money, while only those teams who enter the optional Level 2 and/or Level 3 will compete for the additional levels of money. Teams may enter all 3 levels upon payment. Note: Level 2 entry is not required prior to entering Level 3. Single Engine Big Boy Bonus: Single engine boats have a one-time option to add the $200 Big Boy Bonus until June 27, and only registered single-engine boats are eligible to compete. The team to weigh the single-heaviest king mackerel among the 4 qualifying Palmetto Kingfish Tour events will win. 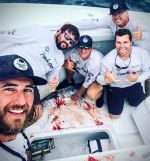 Your boat-team must compete in 2 of the 4 qualifying events, and the Big Boy Bonus winner is determined and paid upon the conclusion of the Marlin Quay King Mackerel Shootout. Your team does not have to qualify for the Tour Championship to win. In the event there is a tie, the team with the earliest time stamp of any 4 qualifying events wins. Note: Purse payouts for the Palmetto Kingfish Tour and/or Tour Championship are 90% of net operating expenses incurred by the tournament.